While Facebook is certainly not a blog website per se, it has been a wonderful vehicle for which to share my ongoing projects and the learning process as I begin to transform them. It’s not always about one project in particular, but my followers seem to enjoy when I post things: the good and the bad. Occasionally, I’m less than thrilled with what’s going on, and I try to be transparent about that. This journey of mine, like most, is not always smooth-sailing. I’m still new to upholstery – I don’t always know what I’m doing. Sometimes, I want to throw someone’s chair out the window and butcher it with an axe.. Start over. I know that I tend to be verbose. Keeping it short, sweet, and to the point has never been my forte. And apparently, since this is my business, and I can run it how I like: I use lots of words. And those words seem to be what attract many of my new clients! I’ve had quite a number of my clients come to me with the pieces that they want to renew, and I’ll often hear something along the lines of, “And this chair has got a story to tell!” That is music to my ears! When I first meet with a client to take a look at their chair, and we sit down to take a look at fabric, the story of their chair and the story of their lives begin to intertwine with one another. Not every upholsterer wants to get into these discussions, as they tend to take extra time, but to me, they’re the reason why I do this. I get to know my clients in a way that many never will – through their furniture, which brings up stories about family and friends that they may have never shared with anyone else. It’s special. It’s unique. And it makes me want to my absolute best work for them. Because this isn’t just any chair. It’s a chair with a story. In case you’ve just discovered my website and have been looking it over, you may have noticed it’s been.. ahem… a YEAR since I posted, you would be justified in thinking that maybe The Chick was no longer in business. The Chick has, in fact, been VERY busy, and had to determine what to concentrate on in her first full year as a real business. I decided to concentrate on the DOING of upholstery, with daily postings on Facebook. It takes a lot to figure out how to best manage your time as a business-owner, and I feel like maybe I’m starting to get the hang of it. It’s truly been a full year, with lots of clients and work, and even a new shop! I’ll make sure to post soon, and show you what I’ve been up to. After all, a new year is upon us, and when better to start something than at the beginning? I’ve been busy! The Chick’s business has picked up considerably in the last couple of months, and I couldn’t be more excited! It might not be obvious, but this thing rocks and spins like nobody’s business! It’s like taking a ride on a bull! He proceeds to tell me stories of him and his cousins playing in this chair for hours, rocking and swiveling it all over the place. To be honest – he made it sound like a lot of fun! The whole time he told me his story, his hand was on the top of the chair, like it was an old friend. His mom says that eventually, he will inherit this chair, and I can tell that he is totally excited about this fact. The Ride was in good condition, but it needed some love. It had been reupholstered once before, in the 70’s. (Found a date and initials inside – I love finding that stuff!) Needless to say, the foam and stuffing had given up the ghost. Yep – that’s foam! The springs were also starting to sag a bit, making it difficult to get out of the chair easily. And while foam and springs are not the most exciting part of upholstery (let’s face it – it’s all about the fabric), they ARE the most important part to giving you a comfortable seat! The Ride was fun, alright, but it was no longer comfortable. I helped my client choose some fantastic, springy foam (did you know there’s different types? ), and promised her that her chair was in good hands. I completely stripped it back, all the way to the frame. (A very messy process on all chairs. I’ll share pics some other day.) I removed the old saggy seat springs and put in new springs. That is as naked as a chair gets, folks. From there, I started building things back up. First came the synthetic burlap to support the foam and keep it from falling through the springs. And added an edge roll to the front, so it would be comfortable for the back of legs. Isn’t it amazing how it’s already starting to look like a real chair? And we’ve only just gotten started! Next, I added foam and polyester batting. This creates the overall shape of the chair. Oh. And Cherry Garcia helped, too. Once I’m at this point, it starts to get really exciting because – FABRIC! I started with the arms. After I refinished the wood parts, I added foam and polyester batting. And then, one at a time, I ADDED FABRIC! By this point, I’m almost giddy with excitement, because you know what comes next! The NEW Ride in town! Aaaaahhh!! I can hardly contain myself! So cute! My clients loved it! And I couldn’t have been any happier about their enthusiasm. Now I’m going to take a nap. What do YOU think of the new Ride? I know the question that’s on your mind. Sure, you’re here to see the pretty before and afters, but what you really want to know is: How much does reupholstery cost? Truthfully, reupholstery is not necessarily always the cheapest venture – but it is less expensive than buying new QUALITY furniture. It really is an investment. You see, much of the furniture on the market today is little more than plywood wrapped with cheap foam. It’s not meant to last forever, so it doesn’t. Conversely, much of yesteryear’s furniture was built to last lifetimes. (I’m sure that’s not the first time you’ve heard this.) As such, sometimes the cost of reupholstering a piece of furniture from yesteryear can run around the same price (or even a bit more) than what you can purchase new. So, why reupholster? Various reasons – you found a fantastic vintage midcentury modern piece with amazing lines for a steal at a thrift store, but the fabric’s torn or it’s dirty, and you’d really rather not know where it’s been; you got grandma’s chair that she used to read to you when you came to visit; you encountered an amazing oak dining set at an estate sale for much less than you could buy new, and it fits perfectly into your tiny dining area… Obviously, the reasons are endless. This is what you need to know: if the furniture you’re considering reupholstering is well-made, has sentimental significance, or is perfect for your space, reupholstering is definitely worth considering! You’re probably wondering if I’ll ever get to the topic you really are reading for: So what’s my investment going to be? The answer is that it varies, sometimes greatly. Obviously something large like a sofa would be more of an investment than an accent chair. Ultimately, the amount of labor that will be involved to tear apart the piece and put it back together is what determines the investment. If something has a lot of fabric, it will be more than something that has less fabric. I hate to try to put numbers out there for non-specific pieces. Every piece of furniture that I work on is basically a prototype. I’ll probably never work on another just like it. Maybe I’ve done some that are similar, but never the same. Each piece is like an archaeological expedition, and I’ve got to sift through everything (sometimes some pretty gross things, but that’s another post), and figure out how to put it all back together. One of the factors I have to consider when I’m figuring out an estimate for your investment include not only the cost of basic labor and fabric, but the actual condition of the piece I’m presented. This includes the materials inside the furniture, like the springs and foam, if they can be used again, or if they need to be replaced. Does the piece has significant damage to the frame that needs special repair work? Are the springs sprung? All of this is very labor intensive, and will add to the amount of time I have to spend on the piece. After all, if you’re going to have it done, shouldn’t I do it right? Your furniture is important to you, so it’s important to me. I understand. Believe me, I do! You want to know if you should even bother looking at old pieces at estate sales if you’re going to find out it would have been cheaper to just buy new. Bottom line is this: Yes, you can buy SOME new furniture for less than I will reupholster SOME old furniture. But what is the quality of the new furniture you’ll buy? If you want high quality, but don’t want to pay the high prices of new high-quality furniture, your best option is to buy old high-quality pieces and have me or a colleague reupholster them for you. You will save A LOT of money purchasing high-quality vintage pieces over high-quality new pieces. If you really want numbers – specific numbers – the best thing you can do is send me a photo of the piece you’re considering, along with the dimensions. From there, I can give you a good estimate of what type of investment you’re looking at. Don’t be afraid to ask. You just may have found that diamond in the rough you’ve been looking for! Today I received my very first business cards for the Chick. 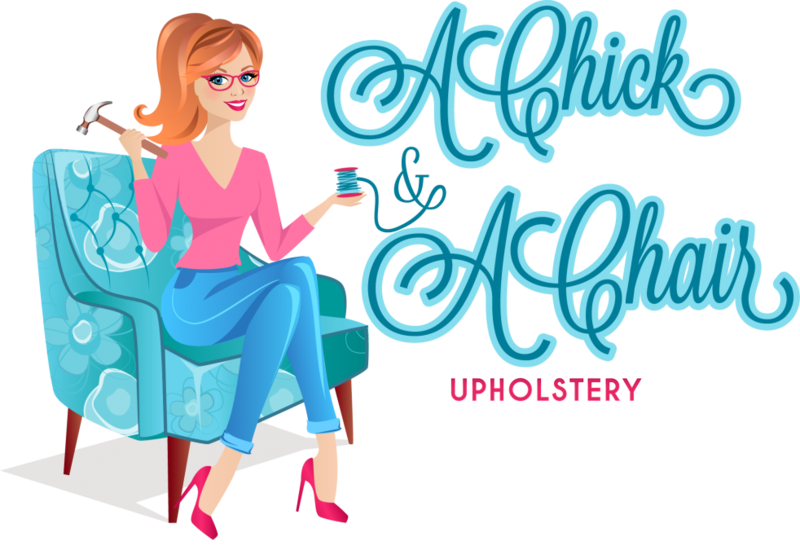 (Yes, I’m calling my business “The Chick” – she is her own entity now. 🙂 ) I can’t tell you how much more real my business became just because of these little rectangular pieces of cardstock! What is it about that glossy little piece of paper with your information on it that makes you seem more “business-y”? It could be that it goes back to the days of old when people all had calling cards to make proper acquaintance. It could be that it’s a physical extension that’s more than cyber-space. It means you’ve made contact. Or maybe it means that I finally can actually hand something to someone when they ask if I have a card. The reason, I have come to understand, has to do with the appearance of a lack of upholsterers. Back in the day, schools had credential and diploma programs for people to go through to learn the business and art of upholstery. Sadly, finding such a course is near impossible here in the United States. Many years ago, schools started to close up those options. The reason why? I’m not sure. I don’t think it was a lack of people wanting to learn. Whatever the reason, in order to learn, you must be proactive. So what does all this amount to? Are upholsterers really that hard to find? Well, yes and no. Since becoming one, I’ve discovered many others in my local area. How? Certainly not by encountering them while out shopping. Many upholsterers now don’t have a storefront you can wander into. Many of us (myself included) literally work from our garages and basements. We need to keep overhead low, and that can be difficult when you have to pay rent. Understandably, many of these folks have enough business that they don’t need to advertise anymore – in places like the Yellow Pages. The Yellow Pages are something of the past – most folks nowadays don’t look to an antiquated book for business. We go to the internet. And that is where I think we upholsterers tend to sink or swim. We need to get your attention – and keep it – and many of the upholstery websites I’ve encountered are utilitarian, but not necessarily interesting. Those folks who have lots of business actually doing upholstery, don’t always have the time to create a website. Many of them have been doing upholstery longer than I’ve been alive. They work by word of mouth – the very best way possible! The problem with us as consumers nowadays is that we don’t tend to talk by word of mouth – we talk by word of the internet, so we miss out on some of the most seasoned professional upholsterers. My point is this: Be proactive. Ask around. Check out different avenues on the internet. And for goodness sake, when someone mentions they upholster, ask them for a card!